Orcas Island Getaway @ Bracken Fern is a great choice for couples, small groups and families. 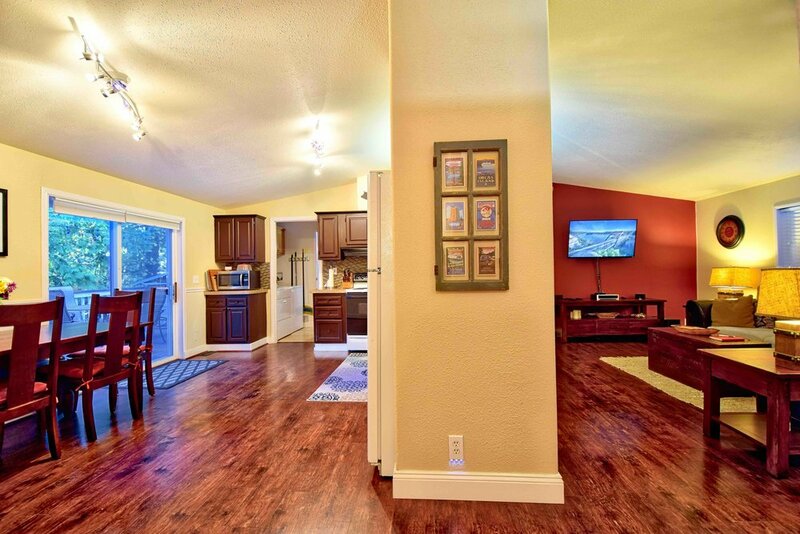 Located on a 3/4 acre parcel surrounded by towering native evergreen trees, this 2 Bedroom, 2 Bath home manufactured in 2001 was completely remodeled in 2014/2015 and offers great privacy despite being just minutes to town. The open layout and high ceilings take advantage of the 1,300 square feet, providing a very spacious feel in the home, and bedrooms on opposite sides allow privacy for couples and families. You'll enjoy relaxing outside on the rear deck, overlooking the large backyard with landscape lighting during the evenings. The deck features a patio table with six chairs, a Stainless Steel propane BBQ grill and leads to the outdoor Hot Tub to end the day in relaxation. Continue reading below to learn more about the home and the quality touches to make your stay not only enjoyable but memorable. We look forward to welcoming you as a guest. Below you'll find a full description of the home and amenities, or you can jump to the section of interest using the quick link images. Space to relax in comfort or to be entertained... your choice. A spacious living room with comfortable seating and modern/rustic decor. Sit back and read a book, listen to music, watch a movie or just enjoy conversations. A quality media center featuring BOSE Entertainment Center, a DVD Library, streaming media. Auxiliary port and Bluetooth adaptor for playing your music. While the Island begs you to get out and enjoy nature, sometimes it's nice to just hang out and relax. 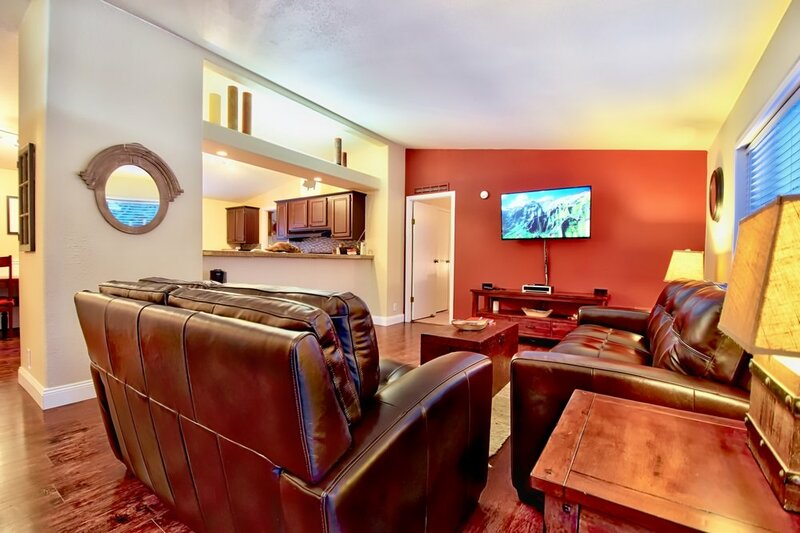 In the living room, you'll find a very comfortable leather sofa & love seat which provides the relaxing atmosphere you're looking for after a day of exploring Orcas Island and its many gems. The theme of "Modern Rustic" is carried throughout the home with the details on furnishings and decor, and a neutral palette of earthy tones provide a tranquil environment for you to unwind. For longer stays, the home also includes a full-sized washer and dryer (with complimentary detergent) should you wish to wash clothes/linens during your stay. We also offer complimentary high-speed internet through the Wi-Fi network with reliable service provided by CenturyLink. You'll also enjoy access to the third bedroom that was converted into an office if you need to get any work done while staying at the home, which includes the use of our printer/scanner/copier and office supplies, also complimentary. There's a dedicated workspace and even a 27" LCD monitor for hooking in your laptop (HDMI and Thunderbolt). Even if you're trying to get away from it all, it's nice to be able to connect if you need to. With the varied topography of Orcas Island, you'll find most parts of the island do not have any cell reception at all. Fortunately, we receive cell signal for the major wireless carriers in and around Orcas Island Getaway. Media Center for music, movies and more. Amazon Fire TV System with complimentary access to Amazon Prime, Netflix and Hulu programming. Note: the home does not have cable or satellite television service. A small (~40) DVD library with popular action, adventure, drama and a few childrens movies. Guest love our helpful User Guide videos & instructions, which will show you everything you need to know. Amazing dishes are being served by the local restaurants in Eastsound and surrounding communities, so don't spend all your time in the kitchen. However, if you enjoy cooking at home as much as we do, then you'll appreciate a fully equipped, and well stocked kitchen to enjoy dining at home. The Kitchen and Dining area easily access the rear deck through a glass sliding door. The table pulls away to reveal bench seating for additional seating to 6. Enjoy fresh fruits & vegetables from local farmers and the seasonal farmers market. You'll find several farm stands throughout the island year-round, offering the freshest ingredients possible. We also have a small fresh herb selection in our planters on the rear deck for you to enjoy during the growing season. Orcas Island Getaway Tip: have some cash handy when visiting local farm stands. Many operate on the honor system by paying for what you take with a cash drop box. The kitchen features full sized appliances, quality cookware & knife set, coffee pot and Starbucks Barista Espresso machine. The opening from the kitchen counter/sink into the living space, along with vaulted ceilings creates a very open space. View from the hall toward living and dining/kitchen space. The roomy Master Suite offers a quality King sized bedroom set with a firm and comfortable Dynasty 12" CoolBreeze Gel memory foam mattress. Between the walk-in-closet, two nightstands, and a full-sized dresser, you should have plenty of space for your belongings upon arrival. The Master Bathroom features a modern glass and travertine tiled shower, a corner soaking tub and dual vanities. Quality linens and bathroom towels provided to guests. The guest bedroom features a Dania bedroom set with a Serta® Perfect Sleeper® Davis Eurotop premium quality Queen-sized mattress set. There's a full-sized armoire, as well as a single nightstand and lamp next to the bed. The guest bedroom has immediate access to the remodeled Guest Bathroom just around the corner. In the guest bath, you'll find a large remodeled shower with a full-length glass rolling door and modern porcelain tiles in the shower and floor. 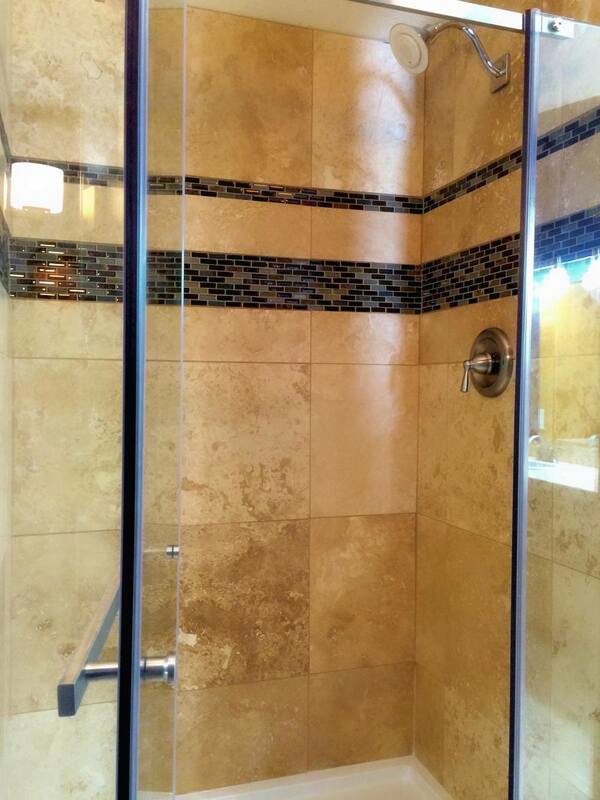 Guest Bathroom with updated & modern shower with full height rolling glass door. Here's a small sample of the items the fully stocked home will have available for you. Be sure to check out our User Guide videos & instructions for a quick tutorial on use and operation. Although the property is surrounded by enormous evergreen trees, you'll find the home is showered with sunlight throughout the day. Lounge in the morning/early afternoon sun on the front deck and afternoon/evening on the rear deck with, BBQ grill and patio set and string lighting for ambiance during the evening. Take a short stroll on the trails through the property. One trail continues and leads you to Crescent Beach Drive, where just a few blocks away, you could continue a short walk to Crescent Beach and the Crescent Beach Preserve where you'll find a 1.5 mile round trip flat trail to enjoy between Crescent Beach Drive and Mt. Baker Road. Path meandering through the backyard is a relaxing walk, leading to a shortcut to Crescent Beach or to the Country Corner Market. Crescent Beach, just a short 5-minute walk from the home. The home is just 1 mile from the vibrant community of Eastsound, the main village Orcas Island, and only two blocks to the beautiful Crescent Beach and the Crescent Beach Preserve. For outdoor enthusiasts, we're a close 3.5 miles from Moran State Park where you'll find Mt. Constitution with over 30 miles of hiking trails, mountain biking, canoeing & kayaking as well as several freshwater lakes. Out on the back deck, you'll find a peaceful escape from everything. Hearing birds singing in the trees and frogs from a nearby pond are a great reprise from the hustle-and-bustle of everyday life. The Hot Tub is located just around the corner from the deck and is sure to help you unwind and is a perfect size for 2-4 adults. Near dusk, you will often see deer making their way through the back side of the property as they head to other surrounding areas in search of tasty treats (unfortunately it's usually our flowering plants). The large deck overlooks the landscaping and outdoor mood lighting - making for a favorite spot you'll spend relaxing day or night. Hot Tub with lounger and LED mood-lighting and landscape lighting through the backyard. Wood-burning fire pit is a favorite gathering area for conversation and making S'mores. Rear deck with patio, grill and lighting create a tranquil ambiance.